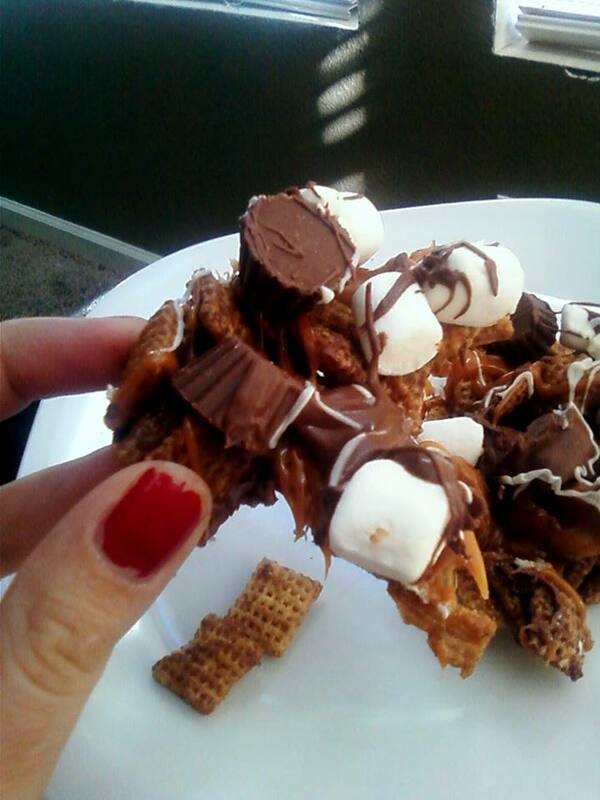 Posts Chocolate Chex Mix Recipe! I decided a while ago that I needed to improve my quality of life. This meant letting go of some responsibilities. This also meant doing more things that make me happy. Like making delicious and sweet treats. I found this recipe by tbspSusan on Pinterest and it’s as divine as it looks! Really easy, really delicious, and a great thing to share for the holidays. She did a beautiful step-by-step tutorial with gorgeous pictures. It’s really worth seeing. I copied the recipe below, as well. Enjoy! Put eight cups (one box) of Chex Mix in a microwavable bowl. Line cookie sheet with waxed paper or foil so it doesn’t stick. In 2-cup microwavable measuring cup, microwave brown sugar, butter and corn syrup uncovered on High 1 to 2 minutes, stirring after 1 minute, until melted and smooth. Stir in baking soda until dissolved. Pour caramel mixture over cereal, stirring until evenly coated. Microwave on High 3 minutes, stirring every minute. Spread on cookie sheet. Cool 10 minutes. Break into bite-sized pieces. 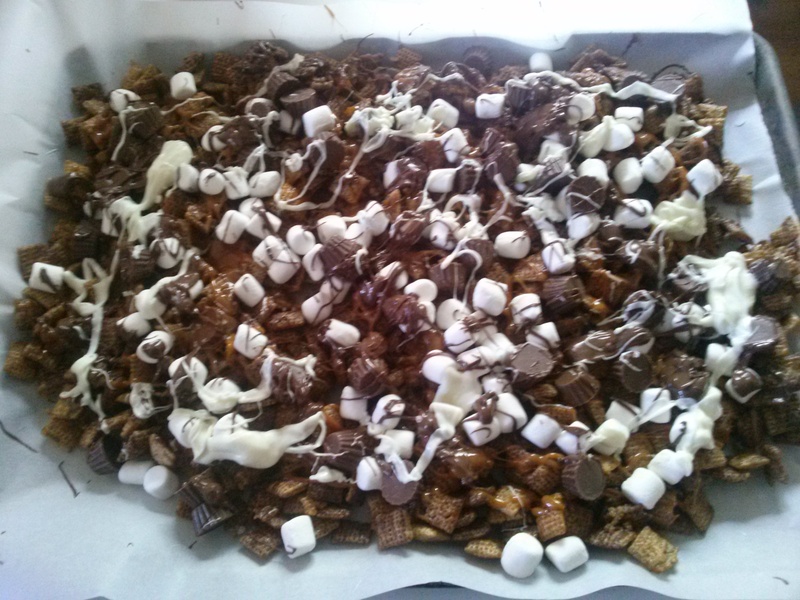 Make sure Chex mixture is cool to the touch (so candy doesn’t melt.) 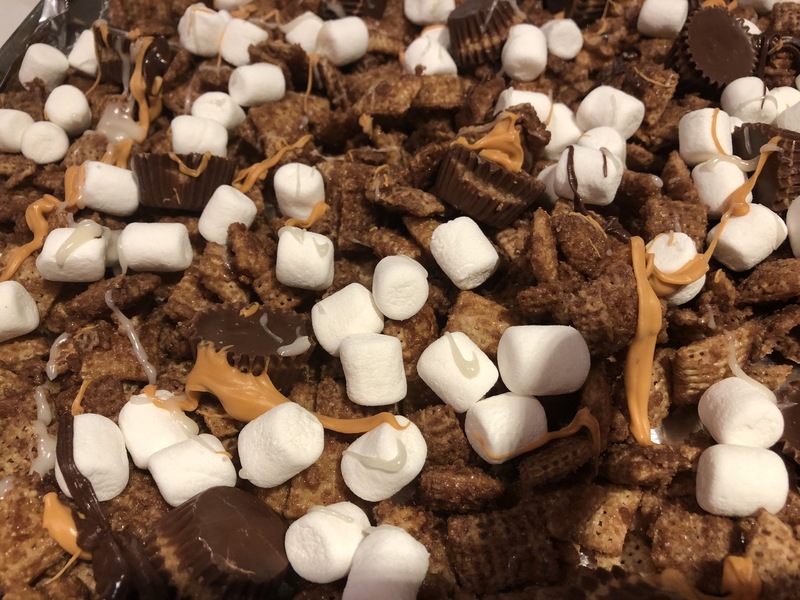 Evenly sprinkle mini peanut butter cups candy and miniature marshmallows over Chex mixture. In small microwavable bowl, microwave caramel baking bits and cream uncovered on High about 1 minute or until chips can be stirred smooth. Use a spoon or fork to drizzle over snack. Microwave the milk chocolate baking chips next, starting with 20-seconds and stirring, then at 20 second intervals until the mixture is completely smooth (microwave temps vary, so watch the chocolate and stir frequently until it’s of drizzling consistency). Drizzle over the snack mixture. Then microwave the vanilla (white) baking chips in 20-second intervals, stirring until smooth, and drizzle that over the snack mixture. (Note: The vanilla and milk chocolate chips should not need cream added.) Quickly sprinkle coarse salt over all while candy drizzles are still wet.